UPDATED: Sat., Aug. 4, 2018, 4:15 p.m.
1. (1) Joey Logano, Ford, 82 laps, 0 rating, 0 points. 2. (4) AJ Allmendinger, Chevrolet, 82, 0, 0. 3. (10) Justin Allgaier, Chevrolet, 82, 0, 50. 4. (8) Ryan Preece, Toyota, 82, 0, 40. 5. (9) Aric Almirola, Ford, 82, 0, 0. 6. (12) Cole Custer, Ford, 82, 0, 31. 7. (20) Brandon Jones, Toyota, 82, 0, 30. 8. (19) Ryan Reed, Ford, 82, 0, 31. 9. (11) Christopher Bell, Toyota, 82, 0, 35. 10. (2) Brad Keselowski, Ford, 82, 0, 0. 11. (27) Tyler Reddick, Chevrolet, 82, 0, 27. 12. (13) Elliott Sadler, Chevrolet, 82, 0, 25. 13. (14) Austin Cindric, Ford, 82, 0, 24. 14. (15) Jeremy Clements, Chevrolet, 82, 0, 27. 15. (17) Kaz Grala, Ford, 82, 0, 24. 16. (5) Daniel Hemric, Chevrolet, 82, 0, 35. 17. (25) Michael Annett, Chevrolet, 82, 0, 20. 18. (7) Ryan Truex, Chevrolet, 82, 0, 24. 19. (21) Alex Labbe, Chevrolet, 82, 0, 18. 20. (23) Ross Chastain, Chevrolet, 82, 0, 20. 21. (36) Brian Henderson, Chevrolet, 82, 0, 16. 22. (37) Joey Gase, Chevrolet, 82, 0, 15. 23. (32) Garrett Smithley, Chevrolet, 82, 0, 14. 24. (39) Spencer Boyd, Chevrolet, 81, 0, 13. 25. (6) Austin Dillon, Chevrolet, 78, 0, 0. 26. (28) Ryan Sieg, Chevrolet, engine, 77, 0, 11. 27. (3) Kyle Larson, Chevrolet, engine, 77, 0, 0. 28. (24) Mike Skeen, Chevrolet, 76, 0, 9. 29. (35) Chad Finchum, Chevrolet, 74, 0, 8. 30. (22) Scott Heckert, Chevrolet, 73, 0, 7. 31. (29) Victor Gonzalez Jr, Chevrolet, 70, 0, 6. 32. (38) Josh Bilicki, Toyota, 69, 0, 5. 33. (34) David Starr, Chevrolet, suspension, 49, 0, 4. 34. (26) JJ Yeley, Chevrolet, brakes, 45, 0, 3. 35. (40) Vinnie Miller, Chevrolet, accident, 32, 0, 2. 36. (31) Timmy Hill, Dodge, reargear, 27, 0, 1. 37. (16) Matt Tifft, Chevrolet, accident, 26, 0, 1. 38. (18) Justin Haley, Chevrolet, accident, 26, 0, 0. 39. (33) Jeff Green, Chevrolet, brakes, 8, 0, 1. 40. (30) Tommy Joe Martins, Chevrolet, accident, 3, 0, 1. Average Speed of Race Winner: 81.686 mph. Time of Race: 2 hours, 27 minutes, 34 seconds. Margin of Victory: 3.362 seconds. Caution Flags: 7 for 20 laps. Lead Changes: 13 among 7 drivers. Lap Leaders: J.Logano 1-22; B.Keselowski 23-30; A.Allmendinger 31-41; B.Keselowski 42-44; R.Preece 45-46; B.Keselowski 47-50; R.Preece 51-55; J.Logano 56; A.Labbe 57-60; J.Clements 61; T.Reddick 62; B.Keselowski 63-73; R.Preece 74; J.Logano 75-82 Leaders Summary (Driver, Times Led, Laps Led): J.Logano, 3 times for 28 laps; B.Keselowski, 4 times for 22 laps; A.Allmendinger, 1 time for 10 laps; R.Preece, 3 times for 5 laps; A.Labbe, 1 time for 3 laps; J.Clements, 1 time for 0 laps; T.Reddick, 1 time for 0 laps. Wins: C.Bell, 4; K.Larson, 3; J.Allgaier, 2; B.Keselowski, 2; J.Logano, 2; A.Dillon, 1; R.Preece, 1; T.Reddick, 1. Top 10 in Points: 1. C.Bell, 747; 2. C.Custer, 715; 3. D.Hemric, 714; 4. E.Sadler, 711; 5. J.Allgaier, 700; 6. B.Jones, 609; 7. T.Reddick, 595; 8. R.Truex, 556; 9. A.Cindric, 508; 10. M.Tifft, 505. WATKINS GLEN, N.Y. – This time, Joey Logano survived the rain. 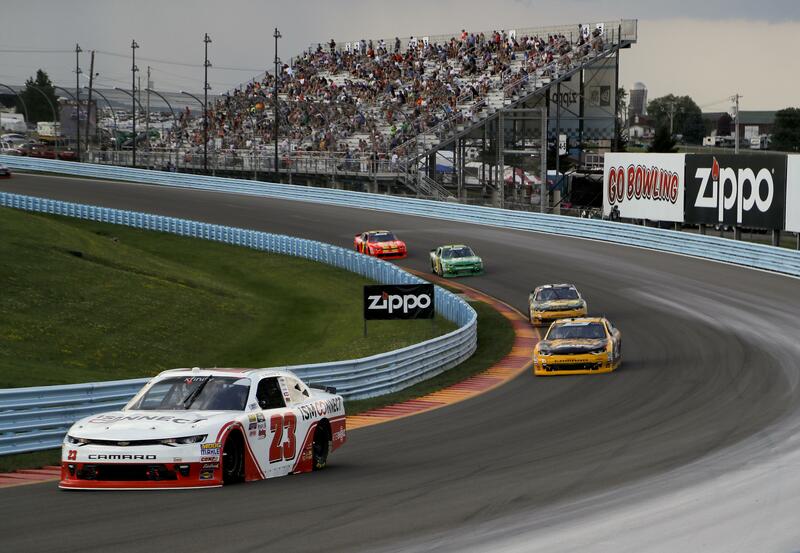 Logano passed Penske Racing teammate Brad Keselowski on a restart in the closing laps Saturday and held off his final challenge to win the NASCAR Xfinity Series race at Watkins Glen International in a race that was red-flagged for rain, forcing the drivers to briefly run on grooved rain tires. Logano, who started from pole, took control with under 10 laps to go in the 82-lap race around the 2.45-mile layout. He dived to the inside on the first turn, making it three-wide going through the 90-degree right-hander. The move forced Keselowski, who was leading, wide as Logano assumed the top spot, leaving his teammate behind. It became a two-car race as Keselowski recovered and the two pulled away. With four laps to go, Keselowski was on Logano’s back bumper as the two sped nose-to-tail. Keselowski lost his chance to challenge for the victory when he skidded out on the first turn with under three laps to go. Logano beat AJ Allmendinger by 3.3 seconds. Justin Allgaier was third, followed by Justin Haley and Aric Almirola. It was Logano’s third win in the series at The Glen and 30th overall, seventh on the career list. Keselowski finished 10th. The Penske drivers struggled on rain tires. They weren’t alone. Bell became the first series driver since Dale Earnhardt Jr. in 1999 to win three straight with a victory last week at Iowa. Sam Ard set the record of four consecutive Xfinity Series wins in 1983. Logano was dominant at the start, leading the entire 20-lap first segment and keeping Keselowski at bay as Cup regulars occupied the top three spots. Keselowski gained the lead after pit stops on a caution early in the second segment as a huge rainstorm moved into the area and began pelting the track. He quickly built a half-second lead over Allmendinger before a crash precipitated the third caution of the race midway through the stage. The cars pitted to put on the grooved rain tires that Goodyear has lugged around to road courses for years. The series had raced in the rain before, in Montreal in 2008, and it proved dramatic with water 6-8 inches deep on parts of the track. Logano wrecked in that race when he slammed into a car he couldn’t see. Canadian Ron Fellows, a road racer used to competing in wet conditions in other series, won that race. Keselowski, who started second, was among several drivers who pitted for regular tires during a caution with a couple of laps left in the second 20-lap segment. Allmendinger held on to win the second stage and the rest of the field pitted for slicks as the track was nearly completely dry again. He dropped deep in the field when he missed his pit box in the wet and was assessed a penalty, then staged a stirring rally. Published: Aug. 4, 2018, 3:19 p.m. Updated: Aug. 4, 2018, 4:15 p.m.